The figure of this bike looks very unique. Well, a Triumph Bonneville T120 650 cc owned by Uji Kuswanto. 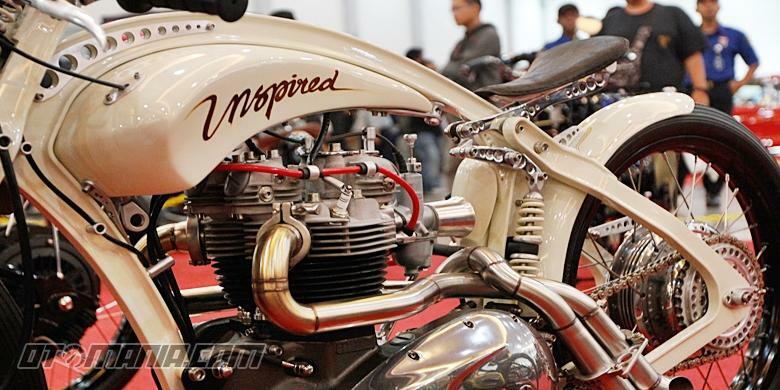 The custom bike called 'Inspired' can be considered radical. 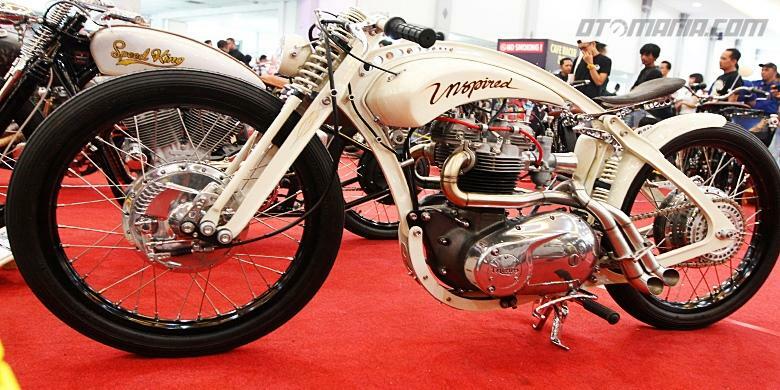 And in the hands of the Malang-based modifications garage called Inspired 27 was able to change completely the manufacturer initial design, without exception. Also visible tidiness in the execution of modification of the bagger concept motorcycle carrying an engine capacity of 650 cc by combining a classic feel and the changes that lumpy handmade. So the result was even able to fool the eye if in fact this is an old motorbike. The frame of motorcycle was full custom and made specifically with the model curve. Uniquely in the bottom and rear connection is not there any sector that is welded, but connected by using some screws at the middle between the bike's seat. By maintaining a vintage impression, used the coil spring suspension models in front and rear to support its sturdy feet of the rims of TK 185-21, complete with the drum of Honda SR in front. While the rear wore the Yamaha RD drum. Its fuel tank designed a quite slim which is then placed under the main frame. Another uniqueness is also can be seen from the winding handmade exhaust models between its twin-head engine. With these performances it is not surprising if this custom built motorcycle was able to grab the title as Best Custom Bike Show at the Kustomfest 2015.